In honor of Labyrinth's 30th anniversary this year, "Jim Henson's Labyrinth: Artist Tribute" comes out next week (on November 8). I can't wait to look through it, and it's sure to intrigue guests as a coffee table book in my home for months to come. "In the thirty years since its original release in 1986, Jim Henson’s timeless fantasy film Labyrinth has captured the minds and imaginations of authors, artists, filmmakers, and fans across the world. In honor of the film’s 30th anniversary, return to the world of Labyrinth and see the beloved characters, imaginative locations, and unforgettable moments as realized by a collection of uniquely original artistic voices in an unprecedented celebration of the cult classic thirty years in the making." 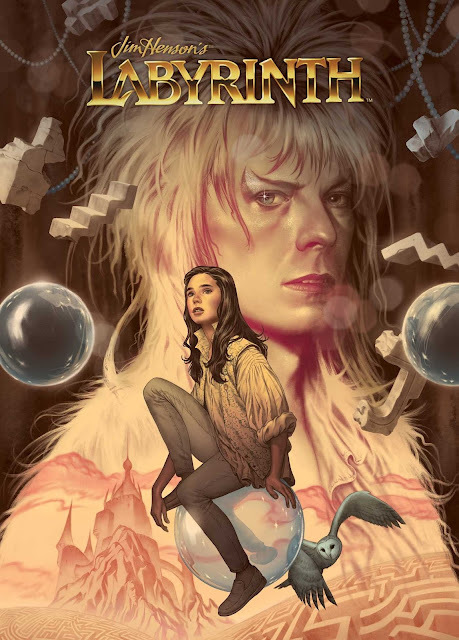 "Labyrinth: Artist Gallery features illustrations and testimonials from comics luminaries and newcomers alike, including: Mike Allred, Joëlle Jones, David Mack, Rebekah Isaacs, Eric Powell, Gustavo Duarte, Jill Thompson, Mark Buckingham, Tula Lotay, Faith Erin Hicks, Ramón Perez, Dustin Nguyen, Mike Huddleston, Jeff Stokely, and many more of your favorite artists!"